Upsets by KEELER (30-1), REGAL SELECTION (29-1) and QUATRO MORO (25-1) ensured there would be a Pick-9 carryover at Caymanas Park today. Only two punters spotted eight of nine to claim consolation prizes of $85,940 each, while three lucky punters won the Super-6, each receiving $593,130. The Pick-9 embraces races three to 11, the Super-6 from races six to 11. We look at the Super-6 which commences with a knotty looking 1700-metre race for the Cash Pot Play Yuh Han Trophy over 1700 metres for native and imported three-year-olds (non-winners of three) to be contested by 11 starters. The leading lights are top weight NEW KINGSTON, stable companion YOJIMBO with champion jockey Omar Walker aboard, along with BURNING CIELO, GUAN YU and the stretch-running filly ANASTASIA, who bids for a hat-trick. Significantly, this race marks the return of three-time champion joc-key Hubert Bartley, who returns to the saddle following a four-year absence. 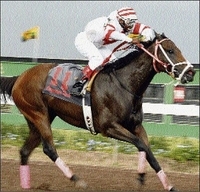 Bartley, who was champion in 1983, 1986 and 1991, is down to ride highly fancied BURNING CIELO, who ran an improved race behind BEAUTIFUL SPACE over 1100 metres on September 19. With the trip now ideal, BURNING CIELO (working well) can fight this out successfully with 54.5kg, The free-running YOJIMBO will be dangerous if leaving the gates promptly, while NEW KINGSTON is not too high in the scales with 57.0lb to rebound. In a really tough race, my idea of the winner is ANASTASIA who, following her second place finish to SAINT CECELIA in the Bigga Oaks, has rebound nicely with back-to-back wins over 1400 metres in good company. Title-chasing jockey Paul Francis again has the ride. Race number seven for the Cash Pot Dash Trophy over 1100 metres looks tailored for down-in-class THE BEST MAN with 4.0kg claiming apprentice Ansley Dancel aboard. THE BEST MAN failed in his bid to make it four in a row over this trip on September 23 when finishing a good second to back-to-form BULLET TRAIN in special claming ($550,000-$500,000) company. Now back to his happy hunting ground and the apprentice reducing the weight to 53.0kg, THE BEST MAN should resume winning ways at the expense of the recent winner CIRCLE DROME, who is also down in class. The eighth race over 1600 metres for the Cash Pot Canter Trophy has a difficult look about it, with horses such as COUGHWAY, GHOST RAPPER, ALLORA, JUNGLE QUEEN and NEPTUNE expected to figure in the 12-strong field. NEPTUNE, to be ridden by the promising 4.0kg claiming apprentice Doushane Gordon from the convenient mark of 50.5kg, really looks tempting at the weights, but preference is for COUGHWAY who finished a close fourth to HE'S REALLY OK and BRUCEON-THELOOSE in the UBA Derby back in June. He has trained well in preparation for the race and gets the nod over NEPTUNE and consistent ALLORA. The 10th race, the $2.95 million Cash Pot 'Only One For Me' Trophy (feature) over 1200 metres, race No. 1 in the $11.8 million Supreme Ventures 2-Y-O series of three, should resolve itself into a straight fight between AL FOUZIA and the promising colt PRINCE THEO. The Rowan Mathie-trained AL FOUZIA (Shane Ellis up) truly impressed in winning her last two races and, as such, gets the vote. Then, take back-to-form ROMEZ, a narrow loser last time out, to beat THE BOMBER and PATTA in the closing 1200-metre race for the Cash Pot Supreme Trophy.